In the early days of OffshoreInsiders.comwe were often asked if Grandmaster Sports Handicapper Joe Duffy, CEO of OffshoreInsiders.comwas related to Kevin Duffy, a well-known, but notorious handicapper from the Stu Feiner family of funds. But whatever become of “The Living Legend” Kevin Duffy? Last we heard, second-hand, was that he moved to South Carolina and was working in some kind of credit card authorization business. But he’s back. He is now radio and telemarketing handicapper Jonathan Stone. Here the unmistakable voice and even more definitive sales pitch, verbatim from his scorephone days. Alert! Alert! Alert! MyBookie is now a 100% bonus up to $1000. Yes, hurry for a limited time! Deposit $1,000 and have $2,000 to bet now at MyBookie! This literally the biggest bonus Joe Duffy has ever seen from a vetted and legitimate sportsbook in the history of the industry. Hurry, we are not sure how long they were make this absurd offer. Outlandish sportsbook signup bonus and everything gamblers must know for today. Alert! Alert! Alert! MyBookie is now a 100% bonus up to $1000. Yes, hurry for a limited time! Deposit $1,000 and have $2,000 to bet now at MyBookie! Bet Now releases “added rotation” games sooner than any vetted sportsbook in the world. They are Joe Duffy’s preferred book for the added rotation games in football and basketball. Vegas Insider and offshore betting expert Joe Duffy gives bettors what they need to know to bank the bet. The top money won handicapper in the 21st century is a handicapper out of Philadelphia who rates his plays 5, 7.5 and 10 stars. He is especially rewarding in professional sports, where his NFL and NBA combined units won is No. 1 all-time. Most of his 10*s are sides, but 10* total TNF from a guy who have been riding successfully since the scorephone 900-number days. Incredibly Important Intel For College Football August 29-Sept 1. Oy boy, has Joe Wiz, Vitor Perrone, and Hank Petrillo started loading up your mailbox too? See the great info above from proven long-time winners. Where is the Sharp NFL Money Tonight? Joe Duffy’s Picks in the midst of a sustained run that literally 99 percent of gamblers will never achieve without him. Intel like this is why. Joe Duffy has been featured on multi-media all over the world as a betting expert. This includes Winners and Whiners, ESPN, Bleacher Report, CBC, CTV, Sports Network, Sports Hog Radio Arkansas, ESPN Radio Utah, ESPN Radio Illinois, PurpleFTW on PodcastOne, Peristyle Podcast, RawTalkOnline, 107.5 The Rock, Big Man on Campus with Jeff Nadu and Donny Rightside, Peter Loshak and others on SBR, including hosting NFL and NBA shows with Troy West. NFL and college football are not the same but many people think they are. Both of these games take place in large stadiums and are broadcast to a national television audience. This makes it easy for viewers to forget that the NFL consists of the top 2% of players and only 1.6% of all draft eligible college players get drafted each year. A lot of fans watch NFL and NCAA because they love football and the tradition that goes with it. While betting enthusiasts can enjoy the thrill of real money sportsbetting on both leagues, there are however some differences between the two and why the NFL is typically easier to win money betting on. We have these listed below. Career Length: In college football the length of a career is between 1 and 4 years. A player’s strengths and weaknesses are uncovered just as he’s about to disappear. In NFL, a player’s career can be anywhere from 8 to 10 years. With NFL fans get to know more about the players too which is what a lot of fans want. Number of Teams involved: The NFL has 32 teams that are categorized evenly into eight divisions. This makes it easy to decide the postseason. With college football, the Football Bowl Subdivision has 129 teams and 130 if you count the transitional Liberty Flames. These are spread across 10 conferences and there’s some independents as well. It can be very hard to keep up with them all which is why Joe Duffy offers free NFL picks and advice during each season to make it easier to keep track of teams and games. Number of Players on a Roster: In professional football, there are 53 players to a team and 46 of those players are active every Sunday. In college football the rosters can have up to triple digits with some players not even having a unique uniform number. There are too many players. Jersey Numbers: Jersey numbers play an important role in the NFL. Numbers in the 20s, 30s, and 40s let people know that these players are running backs on offense and defensive backs on defense. Numbers in the 60s and 70s play in the trenches, and teens and 80s represent the wide receivers. This means that fans can take a look at the field and quickly see what is happening. For coaches and signal callers the numbers help to identify players and it helps with strategizing as well. In college football, the jersey numbers are random and any player in any position can wear any number. You can’t just look at the field and determine what’s happening. Game Length: College football games can be really long and this is because of the rule that calls for the clock to stop all the time. In NFL, the game length is set and you know exactly what you are getting and how long it’s going to take. The average game for NFL last 3 hours and 12 minutes with 12 minute halftimes. Feet Inbounds for a Catch: In professional football, it’s two feet whereas in college football it’s one foot. If a player straddles the sideline as he runs with the ball, his left foot on the grass and his right foot on the white he is out of bounds. If that same player jumps to catch the ball and comes down with his left foot on the green grass and the right foot on the white he will be inbounds so long as his left foot touched the ground first. Overtime: The different here is that with NFL overtime, players keep playing football. In the NCAA, the rules are different. If two teams are tied after the final whistle of the fourth quarter, the teams will meet at the 50-yard line for another coin flip to determine the possession of the first extra period. The teams play extra periods until there is a winner and the order of possession is changed each period. The extra period starts at the 25-yard line and each team is given the opportunity to score a touchdown or field goal. If the teams are still tied, they must play another period. Field Width: In a literal sense, NFL and NCAA fields are the same width but in a strategic sense, they are very different. Hash marks dictate where the ball is spotted. In NFL, these are 18 feet, 6 inches apart. In college football, they are 40 feet apart. This means that professional football games always begin near the middle of the field with equal spacing on both sides. It makes for a tight game with balanced formations and coverage to start with. In college football the game can be loose and sloppy. If the ball is all the way over on one hashmark, the formations are spread and can create space on the wide side of the first that can’t be defended. 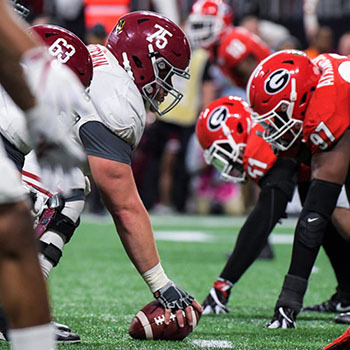 Now that the Supreme Court has ruled to allow states to regulate sports betting, college football conference odds look even more enticing than usual. 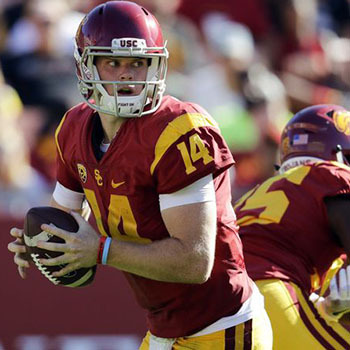 The first set of odds for NCAA football teams to win their conferences are now available. There are some favorites that are standing out so far. In the ACC it’s Clemson. In the Big 12 it’s Oklahoma. The Big Ten favours Ohio State, and the Pac-12 is Washington. The SEC favorite is Alabama. Below we are sharing the full odds for all the college football teams for 2018.